Weekend Responsible Officer: Mel Bailey 07854413518. Please let me know by Friday if you are able to attend. Only internal trackwork this week. In readiness to put Locos back on rails. See area one. 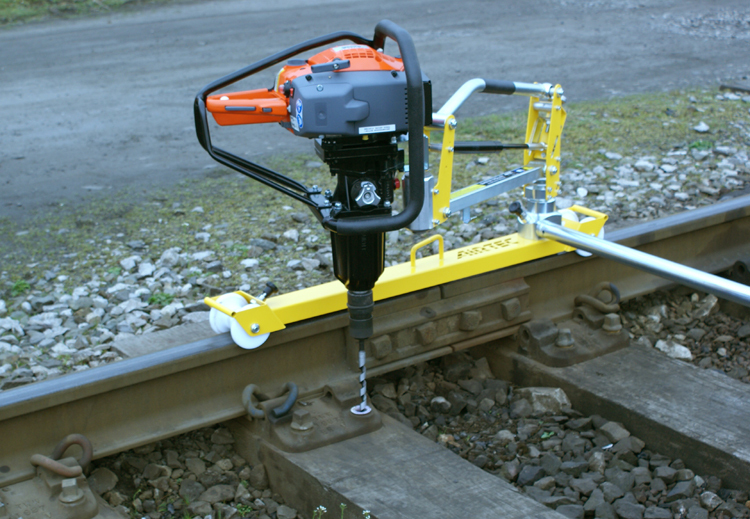 We have a petrol driven impact drill on hire to trial it this week. This is designed to take the backache out of screwing down the brackets. Come and have a go with it , it’s a one day only opportunity! We will be laying further track. Additional sleeper lifting nips have been purchased to allow 8 people to lift a sleeper without strain. Workshop– No work this week on locos. RE-SET the sleeper gap distance to 2 feet between sleepers. This has been checked and is enough for the weight of our locos. Lay additional rail to complete existing sleepers. Fit fishplates (Nuts on outside) please grease the fish plates before fitting. Area three: Ring 6 to 9. Area Four: Ring 9 to 12. Area five: Ring 12 to 16. Most of the machinery had been re-assembled and now requires cleaning down. There are many boxes of tools that need sorting out and identifying then cleaned a list of spanner sizes needs collating, this will enable to put together toolkits and an inventory for each one. Nails and screws have been found again in the areas around our car parking, please sweep if possible. We are unsure where these keep coming from. you have been warned possible unwanted activity. Clear up cups and rubbish. A metal cutting band saw or reciprocating saw. A good sized milling machine. A Bance impact drill for fixing fishplates and screwing (This has its own petrol engine). We are looking to borrow a large still Saw for cutting stone. We need spades, shovels, picks, hammers and barrows. Wire brushes for electric drills.